The above info came from Sascha Goto, and was edited by yours truly (contact me). Captain Future and his crew battle evil villains in various locations. Time travel, parallel dimensions and micro cosmos are some of the extraordinary ones. 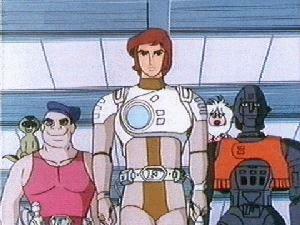 Captain Future's nemesis is Vul Kuolun, who is called 'The Magician of Mars'. Note: Captain Future is based on a series of stories from the 1940's by Edmond Hamilton. The 1980's english version of the "Captain Future" theme aka "They Call Him Captain Future" will be released in January and should be available through all online digital retailers such as Itunes, eMusic, Yahoo Music etc. This track has been remastered from the original stereo masters and is part of a mini album release titled "Captain Future and Other Anime Themes". The release also includes the Captain Harlock theme. These versions were originally part of ZIV International US TV syndication as well video distribution releases in the early eighties. The above description came from Sascha Goto, and was edited by yours truly (contact me).